For more info on planning a Portland getaway at Edgefield, visit mcmenamins.com. After a drive to San Jose and a flight to Portland, I'm fixing to indulge in my three favorite hobbies: eating, drinking, and relaxing! It's a hot and sunny day when my wife and I arrive at McMenamins' Edgefield resort in Troutdale on Aug. 30, just outside Portland. The property boasts a brewery with craft beers, a winery, a distillery, and several dining options. We plan to stay there for two nights before heading to an Airbnb in Portland to celebrate our anniversary. MANOR HOUSE Edgefield, a McMenamins' hotel near Portland, was built in 1911 as the county's poor farm. Edgefield's imposing historic three-story manor house was built in 1911 as the county's poor farm, where the indigent could live and work on the 74 acres of farmland surrounding the main building. 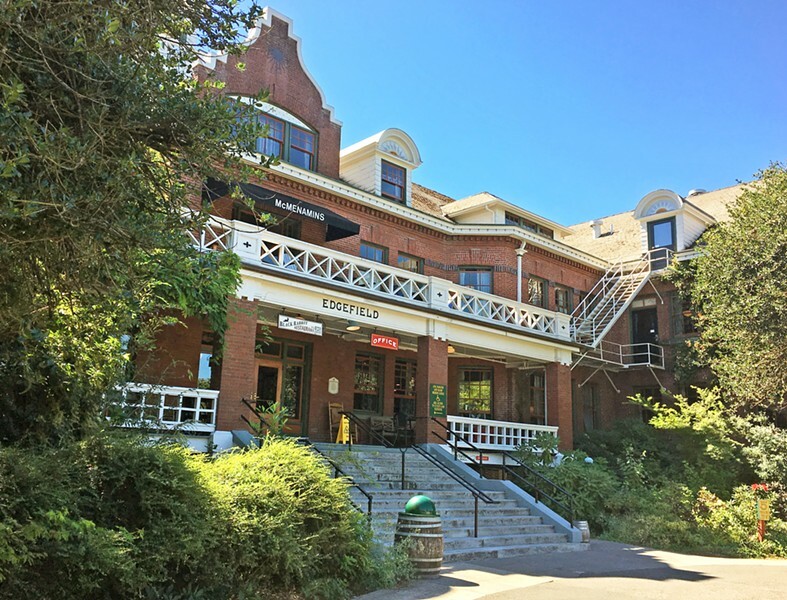 Later it became an old folks home, and finally McMenamins—which has a reputation of repurposing unusual buildings into hotels, resorts, and bars—bought the property, which has more than 100 guest rooms and hostel-like accommodations. Rooms can be reserved, but the hostel beds are on a first come, first served basis. Prepare yourself, because this is not like a normal hotel. We're on the third floor, which doesn't have elevator access. By the end of our stay, we've named the stairs the "Thigh Master." None of the rooms have televisions or phones, and most rooms don't have private baths. Instead, baths are located at the end of hallways. There are six private baths behind a door down a long hall at the opposite end of our room. We never had to wait for a bath to open up. 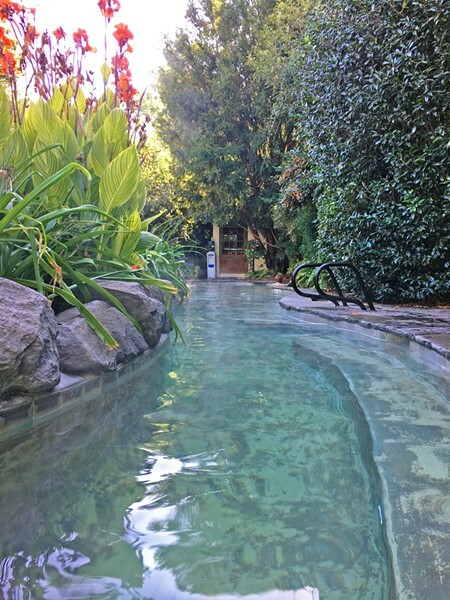 White-terrycloth-robe-clad guests pad up and down the hallway either on their way to the bathrooms or on their way to Ruby's Spa and Soaking Pool, located a short walk through the woods. We're in the B.B. King room, and there's a portrait of the famed bluesman hand-painted directly on one wall as well as hand-painted calligraphy explaining King's ties to the area. Each room is different, and throughout the entire hotel, you'll find original artwork—including a lot of murals in the hallways depicting the property's past as a work farm and old folks home. Even the elbow joints of the exposed plumbing along the ceilings feature little faces painted on them. It's whimsical and charming as heck! GO SOAK YOUR HEAD The Soaking Pool near Ruby's Spa offers plenty of private nooks and crannies to enjoy a private 103-degree soak. Out on the grounds are vineyards, an organic garden, herb garden, and lush landscaping. Some of the food served in the various restaurants is grown on site. There's also a movie theater, an outdoor concert venue (we just missed Michael Franti & Spearhead, who played the week before we arrived), a short golf course, a glassblowing studio, a pool hall, and more. We can't see it all in two days. After we settle in, we decide to walk the grounds. You can get a drink in any of the many bars and take it with you as you walk the property. We check out an organic looking bronze sculpture of Grateful Dead guitarist Jerry Garcia near the concert venue, watch a few duffers making the rounds, visit with some workers tending the organic garden, and eventually get some dinner at the Loading Dock Grill, an outdoor dinning area.